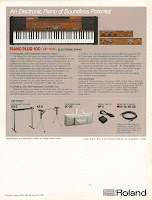 Roland Synth Plus-60 (HS-60) "A synthesizer for all music lovers" four page colour brochure from August 1985. Some synths just don't get the respect they deserve. 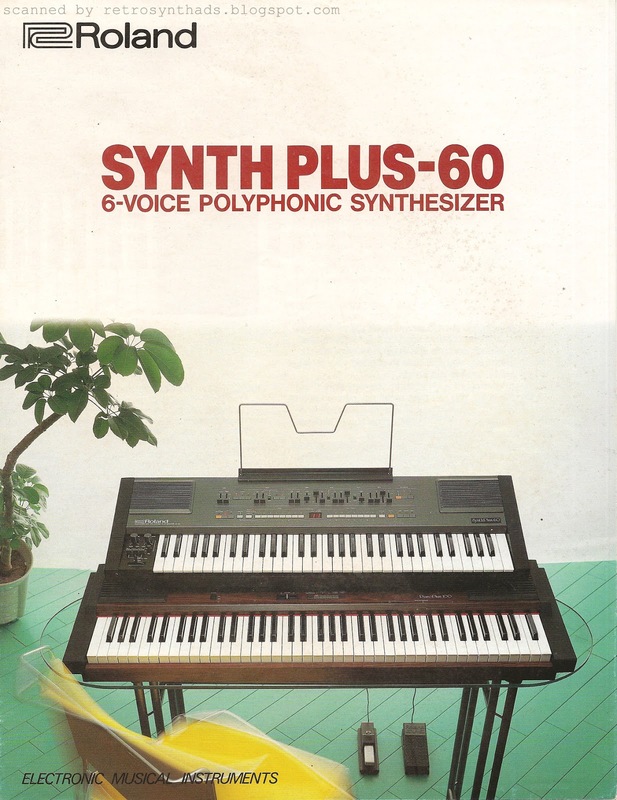 And I believe the Synth Plus-60 is the Rodney Dangerfield of synthesizers. Here's what I'm talking about... the model designations found on the back of Roland's Jupiter range of synthesizers are JP-8, JP-6 and JP-4. But everyone and their mother refers to them by their front panel names - Jupiter 8 / Jupiter 6 / Jupiter 4. Now compare that to the Synth Plus-60 with its lovely large flowing logo found under the right speaker on it's front panel? Pretty much every one and their dog refers to it as the "HS-60" - the model number hammered into the manufacturing label slapped on to the back of the keyboard. Interesting side note: the JP-style model-naming convention was kept for the JU-6, more commonly referred to by everyone on the planet by its front panel name - the Juno-6. But then Roland changed up the model designation format. The Juno-60 model # you'll find on the manufacturing label is the actual name: JUNO-60. Same for the Juno-106: JUNO-106. 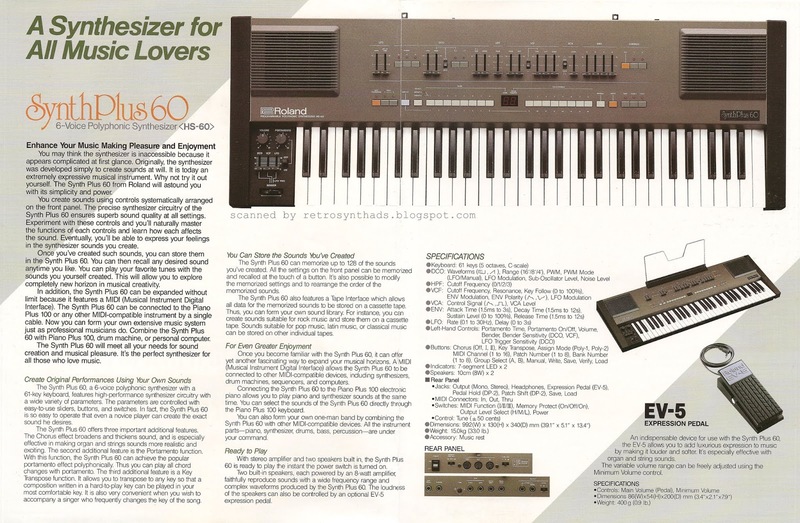 So then why oh why did Roland go back to the old model naming convention for the Synth Plus-60 and give this the ol' "HS-60" designation? And, even then why "HS" and not "SP" (for "Synth Plus"??)? Inquiring minds want to know! Back to the point - shouldn't that poor ol' Synth Plus-60 get the respect it deserves and be commonly referred to as such - SYNTH PLUS-60? Even the big red letters on this brochure's cover makes it obvious that it was Roland's preferred name. To make matters worse, this thing is basically a Juno-106 - that sought-after HIGHLY RESPECTED classic! But even back in the early days of the Internet, whenever I read info about the Juno-106 was mentioned on mailing lists like Analog Heaven or in groups like rec.music.synth, I would only see whispers about the HS-60. They are a physical representation of everything professional studio snobs hate - THE HOME HOBBYIST. Technology has now advanced to the point where everyone is home hobbyist. They just have a different name now - Desktop musician. Or Producer. 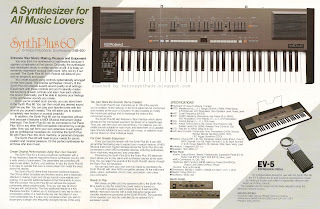 But at the time, it seems like Roland saw this emerging trend and came up with the HS-60 as one of their marketing experiments to get higher quality studio gear into the living room. The brochure itself illustrates how the company clearly went out of its way to market to the non-studio crowd. In other words, those in the house that wanted to create music, but may not have been comfortable around all those studio gadgets. For comparison, just take a look at these 1982 brochures for the SH-101 and Rhythm Machines (click to view the blog posts and scans). Same lovely design format with big red letters and a large product image, but no booze or cool marble motifs. Nope! They've been swapped out for a classic "home style" theme that even included an obligatory house plant. The brochure copy fortifies the imagery found on the front cover with phrases like "simplicity and power", "naturally master" and "express your feelings". Words that invoke emotions that are just as comfortable in the living room as that photo of the HS-60 obviously is. 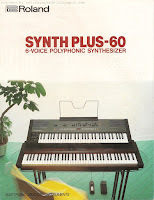 While other synthesizers at the time were praised for their ability to make space-age sounds, the HS-60 is compared to organ sounds and string instruments. 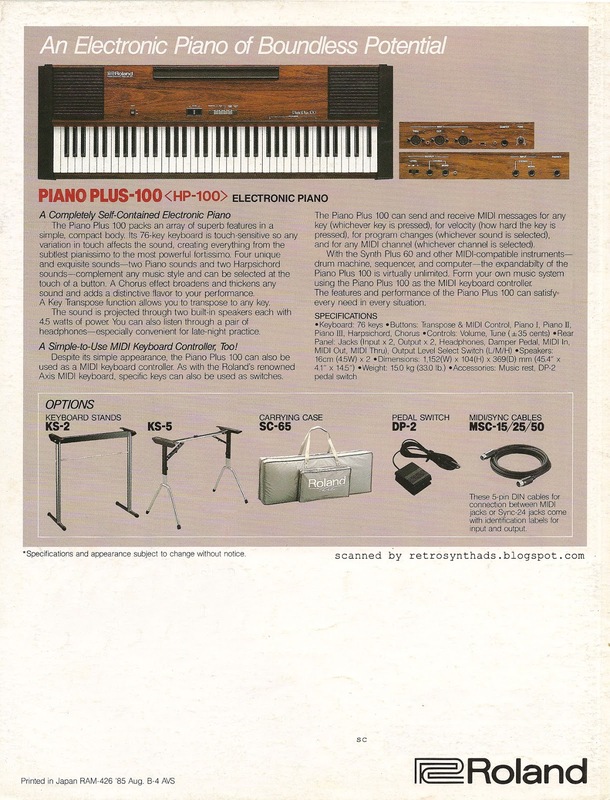 Even when the topic of midi technology eventually makes its way onto the inside pages, references to the piano are listed before references to synthesizers or drum machines. But, here's the problem. Home hobbyists consciously or subconsciously want to be seen as professional musicians and studio engineers. That may be even more true today. And slapping speakers and a sheet music stand onto a professional synthesizer probably didn't help those home hobbyists feel more "professional". So, the niche market that would be attracted to the Synth Plus-60 becomes even more... errrr.... niche-y. That would have been a tough nut to crack! Well, Roland has built a whole new series of synths and drum machines that include built-in speakers - the Boutique series.